You will admit that your website creation or development process is incomplete till you get hold of a good web host. Once you subscribe to any good hosting plan offered by a reliable website host, you can be rest assured that you will get consistent performance for your website for a long period of time. There have been numerous hosting service providers that have been trusted by webmasters all over the world. The key is to select the most appropriate one in terms of your hosting requirements. This is because a web host that may be suitable for someone running a small business may not be the right one for your large business. So, if you are confused about two globally renowned web hosts, like HostGator (site) and DreamHost (site), you need to compare their features and hosting plans. In this article, we give a detailed comparative analysis of the hosting services offered by HostGator with those offered by DreamHost. While HostGator was founded in 2002, DreamHost was already founded in 1996 and DreamHost thus has relatively more years of experience. HostGator is owned by the Endurance International Group (EIG) and focuses mainly on web hosting services, while DreamHost provides plenty of other services, such as cloud storage and cloud computing. HostGator is a Better Business Bureau (BBB) accredited web hosting company. So they are fully committed to resolve consumer issues and complaints in a systematic manner. It has even received the highest possible BBB rating of A+. In comparison, DreamHost is not a BBB accredited business. HostGator has also proven itself as a responsible company by contributing towards green hosting by purchasing certified Renewable Energy Credits (RECs). DreamHost also plays its part as a responsible green host in a similar way. HostGator is one of the rare web hosts that offer Windows hosting in addition to Linux hosting. HostGator gives you an uptime guarantee of 99.99%, while DreamHost claims that it can give your website 100% uptime. However, when you calculate the uptime offered by these two hosting companies in real-time or check their existing customer reviews, you will realise that they have quite similar uptimes. We have tried to host our websites with both these web hosts and experienced their significantly higher uptime percentages. So, there is hardly any difference between the two hosts in terms of high availability for your website. HostGator customer reviews and our experience with its hosting services reveal that they offer significantly high page load speeds. DreamHost utilises SSDs instead of SATA hard disk drives that also clearly gives a major boost to your web page speeds. So, both web hosts are pretty reliable in terms of uptime and speed, with no clear winner between them. HostGator servers are known to run on Dual Xeon processors, while DreamHost servers run on AMD processors. The reason for most pro bloggers suggesting that you opt for either of these two hosting service providers is because they both deliver great performance. So, again, there is no clear winner here. Whether you are a newbie or an experienced webmaster, you will always need the strong support of a good technical staff to help you with your site in an emergency. So, a solid customer support at any time is a must for your website. Both hosting providers offer round the clock support. HostGator gives you more options to contact their customer support at any time, including via phone, live chat, email or the ticketing system, for timely replies and issue resolutions. In comparison, DreamHost offers access to its wiki manual which consists of several troubleshooting tips, how-to articles and more. It also offers customer support via live chat, Twitter, and email. But, DreamHost does not offer any telephone support. HostGator is the clear winner here, because of the quick response time of its customer support staff as well as its flexibility in terms of contacting methods. HostGator offers you access to the industry standard cPanel as your control panel. It is extremely easy to get used to, even if you are completely new to web hosting. Additionally, if you are an experienced webmaster, you will find it pretty familiar to any of the previous control panels that you may have used. It also helps you quickly install multiple apps with a single click, manage file transfers, manage databases and more. DreamHost provides you with a bespoke control panel, which is not similar to the standard control panel. So, you will need some time to get used to this control panel. For first-time users, this control panel is a bit difficult to use. So, despite this control panel offering the most features required for hosting your site successfully, it falls short in terms of how easy it is to use. It is common for web hosts to offer some money back guarantee period to win over the trust of new customers. HostGator offers a money back guarantee period of 45 days. If you think this is pretty long, then you will be pleasantly surprised to know that DreamHost offers a money back period of around 97 days. So, if you are not satisfied with the web host before this period ends, you can easily claim your refund. It is obvious that in terms of this money back guarantee period, DreamHost is the clear winner. HostGator doesn’t offer any free domain, while DreamHost offers a free domain with a subscription to any of its hosting plans. As mentioned earlier, HostGator offers Windows hosting as well. But, we only compare the web hosts in terms of Linux hosting, as DreamHost does not provide you with Windows hosting options. The lowest price for a HostGator hosting plan is $3.99 per month (for the Hatchling shared hosting plan for a three-year subscription), while the cheapest price for a DreamHost hosting plan is $8.95 per month (for their shared hosting plan with a two-year subscription). So, if you are looking for a low budget hosting plan for your low-key website or blog, then HostGator’s basic plans are the most pocket-friendly. HostGator has plenty of shared hosting plans for your varied needs, while DreamHost offers only one shared hosting plan option. We compare the HostGator shared hosting plans with the DreamHost shared hosting plan below. The table below compares HostGator VPS hosting plans with DreamHost VPS hosting options. Here we will do a tabular comparison of the maximum possible configurations for HostGator dedicated server hosting plans with that for DreamHost dedicated hosting plans. 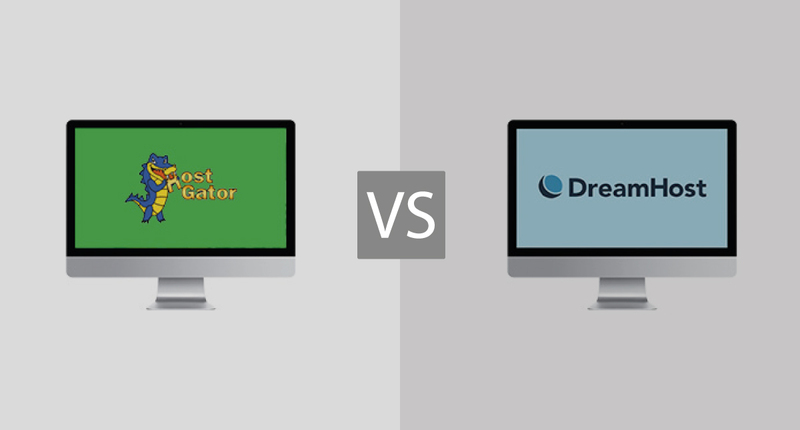 The above comparison of HostGator with DreamHost proves that they are pretty similar, except in terms of a few features. On the one hand, HostGator holds a slight edge over DreamHost in terms of its customer support flexibility and its easy-to-use control panel. If you are a newbie webmaster, you can opt for HostGator, as it offers cheap basic shared hosting plans and you will be able to instantly start using its control panel for executing some quick hosting tasks. Additionally, if you are looking for Windows hosting options, then, HostGator is the right one for you! On the other hand, DreamHost offers you a very big money back guarantee duration along with additional features, such as a free domain and complete flexibility to configure your dedicated server hosting plan. So, it is difficult to pick a clear winner between these two web hosting companies, especially for large traffic websites. You can choose one for your website, depending on the features that are top priorities for your current hosting needs. If I had to pick one for myself i’d go for HOSTGATOR. We hope that the above comparison of HostGator with DreamHost has provided you with useful information and will assist you in choosing an appropriate web host for your website. Please share which hosting provider you prefer between the two, along with any new reasons for this choice other than those already stated above. Thanks for reading! For more information on dedicated servers, you might want to check out our best-dedicated servers guide here. You can get HOSTGATOR shared hosting for just $3 p/m ( 36 months sign up ) which works out as 60% OFF normal prices for shared hosting. Here’s the DISCOUNT LINK to get this deal.